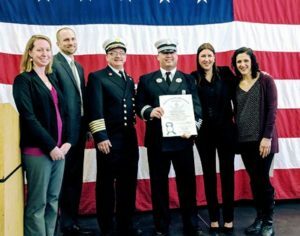 Shrewsbury – Shrewsbury Fire Captain Sean Lawlor is one of 36 fire service leaders from across the commonwealth who graduated from the 25th Chief Fire Officer (CFO) Program at the Massachusetts Firefighting Academy in Stow Feb. 1. Surrounded by town dignitaries and family, it was a great day for Lawlor, who is one step closer to his goal of becoming a fire chief. Lawlor grew up in Shrewsbury, graduated from Shrewsbury High School in 1993 and went on to study at Bridgewater State University. He began his career as an exercise strength coach at the College of the Holy Cross before becoming a firefighter. He is married and the father of three children, ranging in age from 5 to 9. Since joining the Fire Department 18 years ago, Lawlor has been active, taking the steps necessary and finding the needed resources to achieve his goals. He explained that this program was the next step. The 14-week, 112-hour course, presented in partnership with the University of Massachusetts Edward J. Collins Jr. Center for Public Management, is a demanding capstone course designed to provide the new chief officer with a variety of leadership and management skills essential in municipal management. “It was an honor to represent the Board of Selectmen and be in attendance for Captain Lawlor’s graduation ceremony,” noted Shrewsbury Selectman Beth Casavant.